Daily Illuminator: Now In Stores! July 28, 2014: Now In Stores! We've got some great stuff you should be seeing in stores any day now! 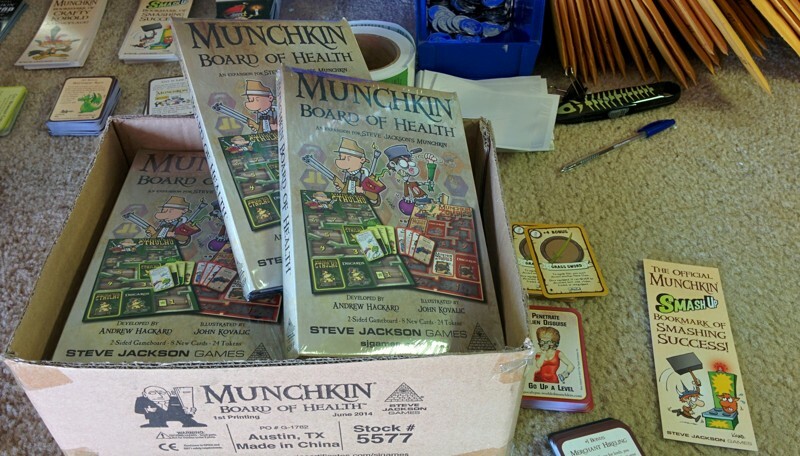 First up, we've got the Munchkin Board of Health, which you can see in our picture to the right. This is a double-sided board with spaces to track your level, and it's perfect for Munchkin Zombies, Munchkin Cthulhu, or both! It'll fold right up and fit in either box. And of course it has new cards! Oh, and have you been missing Munchkin Fu? Well, good news; it's back in print after over a year out of stock! Now you can kung fu fight with all your friends again! And speaking of reprints, we've got a big one. It's been out of print for several months, and fans have been asking for it, so make sure to check your FLGS for a brand new copy of Munchkin Quest! That's right, it's back in stores. If you can't find these things in your FLGS, be sure to check out Warehouse 23. You'll find them all there, and all orders except the very smallest come with bookmarks and promo cards! We're also bringing Munchkin Legends 2 -- Faun and Games out to you in August, so stay tuned for that!